The Hillsboro Main Library will showcase Irish music and dance on Sunday December 7, 2008 at 2 p.m.
An Damhsa is a journey from Ireland to America and back again. Maldon Meehan's group of musicians and dancers perform American clogging and Irish, modern, sean-nós and Cape Breton step dances. Sean-nós dancing is step dancing from the West coast of Ireland. Improvised, with the steps are danced close to the floor, this dance has a close connection to the rhythm of music played. Featured dancers include Maldon Meehan, Melia Tichenor, Maureen Sheridan and Graham Smith. Portlands Nancy Conescu and C. Throgmorton will play traditional music on guitar and fiddle. Dublin-born Robert Deans will narrate. This great for-all-ages, high-energy performance will feature light refreshments. 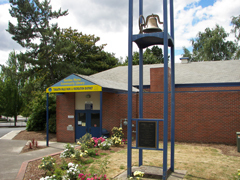 The Hillsboro Main Library is located at 2850 NE Brookwood Parkway. The Friends of the Tualatin Public Library hold their Holiday Used Book Sale Saturday, December 6. The sale takes place at the Tualatin Haggen Food & Pharmacy, 8515 SW Tualatin Sherwood Rd, in the food court. This Haggen is just around the corner from the Tualatin Public Library. The special Friends preview sale runs from 9:00–10:00 AM (check out tualatinfriends.org for information on joining); the public sale is from 10:00 AM to 5:00 PM. This holiday used book sale is huge! Used books, cds, movies, canvas book bags, stocking stuffers, and especially paperback books, will be available for sale. The WCCLS website will be unavailable from 6:30-9:30pm on Sunday, December 7. And by unavailable, I mean, it will be down. You will not be able to renew books or put them on hold; you won't even be able to access the catalog or check out our booklists for the homebound. What does this mean to you? Well, do your library business either before 6:30pm on Sunday, December 7, or do it after 9:30 on December 7. Why is this? Well, as you know, the internet is not a big truck. It's a series of tubes. And sometimes those tubes get a little clogged. You know, like your kitchen sink on Thanksgiving evening. We're going to be doing some maintenance on our corner of the internet on Sunday night. And then we'll be back. Count on it. This is a fun, interactive workshop that incorporates American Sign Language into theme-oriented play activities. Sing songs, learn and review favorite signs, play and interact with your child. Geared for families who have done some signing, but also serves as an ideal opportunity for beginning signers to sample a SmallTalk Workshop. Targeted to families with babies from 6-24 months, but open to all ages. Vampire or Werewolf? Edward or Jacob? Are you a fan of Stephanie Meyer’s Twilight Saga series? Then come join Tualatin Public Library for a pre-movie party on November 16 from 2-4 p.m. The Library is located at 18878 SW Martinazzi Ave. The party will be in the Teen Room. We’ll be celebrating with trivia contests, prizes for best costume, raffles, music and blood-red food. Are you as excited about the release of the "Twilight" movie as we are? The Hillsboro Shute Park Library, 775 SE Tenth Avenue, is hosting a party in honor of the movie release on Thursday, 11/20/08. The party begins at 6:30 p.m. and registration is required. Registration can be done online at http://hillsboro.plinkit.org /news-events or call the Hillsboro Public Library at 503-615-6500. The party is for teens in grades 6–12. Come dressed as your favorite character and be entered to win prizes, such as movie passes, copies of the "Twilight" books, and movie posters. We will have Twilight trivia, jewelry making crafts, a T-shirt design station (please bring a T-shirt to decorate) and lots of snacks! The Library thanks Regal's Evergreen Parkway 13 for help with this event. Regal's Evergreen Parkway 13 presents the "Twilight" opening Friday, November 21, with a midnight screening Thursday, November 20. Award-winning Oregon author Gretchen Olson to visit the Hillsboro Main Library. Gretchen Olson will discuss her new novel "Call Me Hope" on Saturday, October 18, at 11:30 a.m. at the Hillsboro Main Library, 2850 NE Brookwood Parkway. This event is free and open to the public. Gretchen will also share the work she has done with the national organization Hands & Words Are Not for Hurting, for which she received the University of Oregon's Community Award. Prior to her public appearance, the author will join the library's Mother Daughter Book Club for a 10:00 a.m. discussion of "Call Me Hope." This is the story of Hope Marie Elliot, a resilient 11-year-old girl struggling to live under the pressures of her verbally abusive mother. Instead of running away, Hope creates survival strategies for herself. Hope is a winsome character whose bravery and determination resonates with middle-grade readers. Gretchen is also the author of the young adult novel, "Joyride" and she lives with her husband on their blueberry farm in Oregon. She herself, just finished reading "The Mother-Daughter Book Club" by Heather Vogel Fredrick and loves the idea of visiting such a group. The Mother Daughter Book Club at the Hillsboro Main Library is for girls in grades 3 through 5 and their mother or another special woman in their life. Discussions last about an hour and light refreshments are provided. No registration is required. 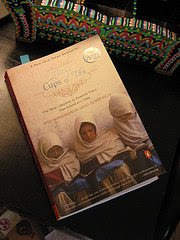 For more information about the Mother Daughter Book Club, email Hillary at hillaryg at ci.hillsboro.or.us, call 503-615-6500 or visit the library. Parents may want to be aware that there is one occurrence of questionable language in the book. If you would like to discuss the appropriateness of this book for your youngster, please feel free to call Hillary Garrett, Reference Librarian at 503-615-2482. Book Club Kits Available now! Cedar Mill Community Librarians Laura Baca and Mark Richardson have developed a collection of book club kits to make hosting your own book clubs easier than ever. They're holdable and available for loan throughout the county. Each kit has 8-10 copies of a book and a leader's guide. This new service makes it easy for all members of a book club to borrow a book at the same time. The kits are loaned for 30 days. Book clubs are great. But there are so many details to take care of if you're doing your own: where to hold it, who to invite, what food or drink to serve (or not), and last but not least, what to read. And how do you make sure that the book is accessible, affordable, and available to everyone in your club? These books are adult fiction and non-fiction titles that address diverse subjects, characters, situations and points of view. The leader's guide has background information about the book and author, as well as supplemental materials like reading guides and movie adaptations. The kits have a 30 day checkout period. If returned late, the fine is $1 per day. They may be renewed once. Loving Frank by Nancy Horan. To find the book club kits, just go to www.wccls.org/polaris/view.aspx?title="book+club+kit"
For more information about the kits, call Mark or Laura at the Cedar Mill Community Library (503) 644-0043 x131. Funding for this project comes from the Washington County Arts, Heritage and Humanities Coalition and the Oregon Cultural Trust. Friends of Cornelius Public Library have their twice yearly book sales on the first Thursdays in May and October. Booklovers, mark your calendars! The next sale is Thursday, October 2nd, 9am until 8pm in the Old Fire Hall (aka, The City Council Chambers), 1310 N. Adair St in Cornelius. We will have books, puzzles, audio books, music, video tapes and DVD's -- even some old vinyl records! Don't miss this book sale with lots of extras! All proceeds go to the Friends in support of Cornelius Public Library activities. Contact the Cornelius Public Library for more information at library@ci.cornelius.or.us or 503-357-4093. The Tualatin Public Library is pleased to announce the launch party on Thursday, September 18, 2008 at 7 PM for a new children's book by local author and artist Addie Boswell. A freelance artist and writer who makes her home in Portland, Boswell has chosen the new Tualatin Public Library (18878 SW Martinazzi Avenue) as the site to introduce her first picture book, The Rain Stomper. A mural created by Boswell and students from Bridgeport Elementary hangs in the children's room of the new Tualatin Library. As an artist Boswell says she "has great faith in the imagination of children and the importance of creativity." She will be joined at the launch party by local members of First Book, a national non-profit organization that give grants to organizations to buy books for low-income children to start their own home libraries. Recent grant recipients included Lifeworks Northwest (Beaverton), Oregon Child Development Coalition (Cornelius), Mount Hood Community College Early Head Start (Gresham) and West Women's & Children's Shelter (Portland). 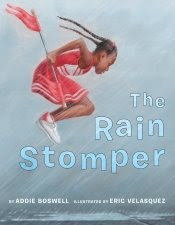 A portion of the proceeds from the sale of each autographed copy of The Rain Stomper sold during the evening will go to support First Book's work in the local community. "Addie's mural, Turning the Page, is a fabulous collage that illustrates the power of imagination that books unleash in young minds. First Book works to ensure that all children have the opportunity to enjoy that power of reading," says Meghan Moran, Chair of the Tri-County chapter of First Book. In addition to the first public reading of the book, the evening's festivities will also include an all-ages art activity led by Boswell. 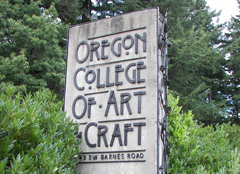 The library at Oregon College of Art & Craft will be closed for construction from August 12 - August 30. The OCAC collection, however, will still be available to WCCLS members—just place a hold on the item you'd like, and it will soon be on its way to your member library. The newly remodeled Tualatin Public Library hosted a reception honoring the 2008 WCCLS Photo Contest participants on Thursday, July 17. The winning photographs in both the youth and adult categories were unveiled at the reception. Contest prize sponsor Wayne Welch, owner of Oregon Photo & Digital, presented the awards for 1st, 2nd and honorable mention in each age category. A continuous photo slide show displayed all the participating photographs. The winning photos will be used on the WCCLS website, with several already in rotation on the front page. The photos will also begin a countywide tour of the WCCLS member libraries, including a display in the Washington County Public Services Building. You can view all the participating photos at http://www.flickr.com/photos/wccls/. 183 pictures submitted by 121 contributors. 5 judges reviewed and selected 4 winners in young adult and adult photography. In young adult submissions, 24 young adults contributed 36 photos. Entries came from Aloha, Banks, Beaverton, Cornelius, Forest Grove, Gales Creek, Gaston, Hillsboro, Metzger, North Plains, Portland, Sherwood, Tigard, Tualatin, & Yorktown, VA. The libraries of the Washington County Cooperative Library Services are beginning to use PC Reservation, a new internet computer reservation and time management software. This software will allow library members and guests a new way to sign up for computer time and manage their print jobs. While West Slope Community Library has been using PC Reservation since June 10, the majority of libraries will not begin their installations until July 14 running through the 25th. On the day of installation, internet computers may not be available to members. If you have used the libraries' internet computers before, this new software will not be unusual. If no one is sitting at a computer, you can press any key or move the mouse to escape the screensaver. You will notice that the computer is either reserved or available. If it is available, click on the colored Available link to sign in. Enter your full WCCLS library card number and password. If you do not have a WCCLS library card, see library staff to get a guest pass. If you need to leave the computer for a moment, you can easily lock it by clicking the Lock button in the Session Information window. When you come back, you just log in, and you're back where you were before you left. When your session is coming to an end, you'll see a message that will allow you to save your work. When you are finished, just click Done, also in the Session Information window, to log out. If you still have money on your print account from the old software, it will be transferred to the new system. And if you have problems with printing, you're still welcome to ask a library staff member for help. Check out thousands of donated books and other media at the Garden Home Community Library's Summer Used Book Sale. It's taking place from 11 a.m. to 3 p.m., Saturday, August 9 at the Garden Home Recreation Center under its awning. The Garden Home Recreation Center is located at 7475 SW Oleson Road in Portland. The collection runs the gamut, and are priced to move at 50 cents to a dollar each. And if that's not enough, the Rec Center is also hosting their annual Bow Wow Bash, which also takes place from 11am-3pm. The bash includes the Beaverton Police K9 Unit, fly ball demonstrations, dancing dogs, agility course, information booths, raffle, and food, with special guest The Oregonian's Deborah Wood. Join us Saturday, August 9th, 11:30am after the Crawfish Parade for the official Grand Opening of the Library. Mayor Lou Ogden and City Manager Sherilyn Lombos will preside over the festivities. Learn more about the spectacular art featured in the library, as well as the artists who created it. Live music and refreshments will be provided. The Tualatin Public Library is now open in its newly remodeled building. The renovated building is located at 18878 SW Martinazzi Avenue in downtown Tualatin. Initially, the library had announced Monday, July 14 as the opening date. However, they opened Friday, July 11 at 10am, several days ahead of the published opening date. But that's not all. Energy-efficency and sustainability are not just buzzwords for the Tualatin Public Library. The remodeled building uses natural ventilation, day lighting, selection of materials, energy efficient lighting and mechanical units, as well as controls that monitor and adjust for use and time. The project has been registered with the US Green Building Council, and would have been able to achieve a LEED (Leadership in Energy and Environmental Design) certification of Certified or Silver if certification had been pursued. Monday & Thursday 10 a.m. - 9 p.m.
Friday & Saturday 10 a.m. - 6 p.m. The Bethany branch of the Cedar Mill Community Library is celebrating one year of library service! It’s been a busy year filled with check-outs, check-ins, and lots of holds. And we're flattered that the Bethany community has really embraced its new library. In celebration, you’re invited to our Anniversary Bash—an afternoon of treats and magical entertainment with Ryan Thomas, a student magician who performs really “cool stuff!” Saturday, 7/19, 2-4 pm. No registration is required, and it's free! The Cedar Mill Community Library at Bethany is located at 15320 NW Central Drive Suite D-6, in the Bethany Village Shopping Center. For more information, call (503) 617-7323. Audience members can register for the Summer Reading Program that evening. Throughout the summer, participants who fill out reading logs may enter a drawing for a themed gift basket at the end of the program. Baskets will be on display at the kick-off. “Executive Privilege,” a political thriller, investigates the deaths of two young women who had connections to the President. The action travels from the White House in Washington D.C. to death row in Oregon. A series of six home interior-design classes by interior designer Angela Todd on Tuesdays, beginning on Tuesday, June 17. A discussion of Knots and Crosses by Ian Rankin at the Mystery Book Group on Thursday, June 19 at 6:30 p.m.
An Evening Book Group discussion of The Road by Cormac McCarthy on Wednesday, June 25 at 7 p.m.
A presentation about "The Ten Essentials of Hiking" presented by outdoors & fitness writer Megan McMorris on Thursday June 26 at 7 p.m. The Quintessential woodwind quintet plays familiar classical music pieces on Sunday, June 29 at 2 p.m.
To participate in the Adult Summer Reading Program, sign up any time at the Tigard Public Library beginning Monday, June 16. For more information, please call the Library at 503-718- 2517. A variety of events are also scheduled for July and August. For a complete list of Adult Summer Reading events visit the Library’s web page at: http://tigard-or.gov/library. The Adult Summer Reading program is made possible through the generous support of the Friends of the Library. After a year of camping out at the temporary Nyberg Street location, the Tualatin Public Library is nearly ready to make the trek back home to the renovated building located at 18878 SW Martinazzi Avenue in downtown Tualatin. Friday, June 13, 2 p.m. 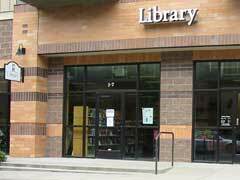 The Tualatin Public Library will close the Nyberg location early. Loan periods will be extended during the time the library is closed. Materials borrowed from the Tualatin Library won't be due while the library isn't open. Saturday & Sunday, June 14 & 15: 12:30 - 5:30 p.m.
During this week the library will provide children services and patrons can come in and pick up their holds at the Nyberg location. However: the upper level will be closed. There will be no adult services and no public internet stations. Closed to complete the move. The Haggen Foods book return will remain open and the new Martinazzi library book return will be open. Monday, July 14, 10 a.m. The newly remodeled library will reopen at the 18878 SW Martinazzi Avenue site! Monday – Thursday 10 a.m. - 9 p.m. Need more information? Check out www.tualatinlibrary.org or call (503) 691-3074. Due to moving books and book shelves around, the Children's area of the Beaverton City Library will be closed 2 to 3 days beginning Wednesday, May 28, 2008. Or as one of the Beaverton children's librarians says, "things are changing! We are rearranging!" Saturday, May 17, 2008 marks the Friends of the Tualatin Public Library Used Book Sale. The sale takes place at the Tualatin Public Library, 8380 SW Nyberg Rd from 10 a.m. to 2 p.m. The used book sale features CDs, fiction, and non-fiction materials. The Friends need book donations for this and future sales. Please put your old books and movies back into use by bringing them to the Tualatin Public Library today! Contact (503) 691-3071 for more information. The Friends of the Hillsboro Public Library always throw a good book sale. But do you think of the Friends when you think of fine mid-century furniture? Maybe you should. The semi-annual sale takes place during library hours, May 2nd - May 11th, at the Hillsboro Public Library's meeting room. The library is located at 2850 NE Brookwood Pkwy. Open hours are Monday-Friday, 10 a.m.- 8 p.m., Saturday, 10 a.m.-6 p.m., and Sunday 12 - 6 p.m.
As you might expect, the book sale features a healthy selection of fiction, non-fiction, kids, and foreign language books. They even have comic books, CDs, cassettes, vinyl LPs, videos and DVDs, and software. This year, the Friends will also have 25 mid-century Herman Miller by Eames Swivel Bucket chairs for sale. The library surplused the chairs from the staff lounge. The prices are right: $50-$125, depending upon condition. Come early for best selection. The WCCLS Photo Contest deadline for entries has passed. We received over 180 photographs from Washington County residents, so our judges have their work cut out for them. Watch the News & Events page for an announcement about the winning entries soon. Prizes will be awarded in each age category for First Place, Second Place and Honorable Mention. Prizes are sponsored by Oregon Photo & Digital. First Prize: 16x24 canvas wrap of the winning photo. This prize is valued @ $125. Second Prize: 8x10 framed & matted print. This prize is valued at $51. 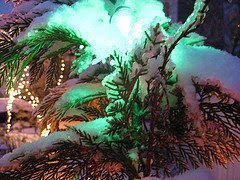 Two (2) Honorable Mentions: $15 gift certificate(s) for Oregon Photo & Digital. First Prize: 11x17 framed & matted print. This prize is valued at $75. Second Prize: $25 gift certificate for Oregon Photo & Digital. Photos may be showcased on the www.wccls.org website for up to one year. Contact us if you have any questions. Many thanks to all who entered! … and the rest include Genealogy research materials, Auto repair manuals,Literary Analysis, Biographies, Reference Books, Downloadable Audio Books, Newspaper articles, Antiques description and pricing, Name/Address directories for business and residences, Children's e-books, Investment information and analysis, World catalog of books, Country and state reports, Science experiments, Government publications, Career and employment, and E-books. The survey is now concluded, but we got over 600 responses and many creative names. Thank you! We'll need a little time to analyze the responses, but we hope to post the results and the new name soon. Watch for an announcement in News & Events. Another great book sale is coming right up! Saturday, May 3rd, 2008, the Friends of the North Plains Public Library host their annual book sale. It takes place at the Jessie Mays Community Center, 30955 NW Hillcrest in North Plains from 8:00 a.m. to 4:00 p.m. The Friends will accept book and media donations on Friday, May 2nd at Jessie Mays from 1:00 to 4:00 p.m. The sale features very reasonably priced (read: cheap) donated and duplicate library materials, and a good supply of VHS movies, children's books, audio books, and bestsellers. All proceeds support the North Plains Public Library. The Friends of the Banks Public Library Annual Plant and Book Sale will be Friday, May 2 from 3-7 p.m. and Saturday, May 3 from 9-3 p.m. The sale will feature many types of plants, including vegetable starts, annuals, perennials and trees. Hard and soft cover books will be for sale for all ages, as well as some videos. If you have plants or books you would like to donate for the sale, please contact Banks Public Library at (503) 324-1382. Thanks to the generosity of Cedar Mill Community Library and Beaverton City Library, we now offer Gale Virtual Reference Library to all WCCLS patrons. With your WCCLS library card, you can search a collection of online reference e-books for both adults and young people. Find reliable, authoritative information in the fields of history, social sciences, government & law, religion, science & technology, biography, and literature. Gale Virtual Reference Library is available on the Periodicals pages under these subjects: eBooks- Adults, eBooks-Children, Reference, and Youth. Put Saturday, April 26th on your calendar! Don't miss the annual Friends of the Sherwood Public Library Used Book Sale! The sale runs from 10:00 a.m. to 4:00 p.m. at the Sherwood Senior Center, 21907 SW Sherwood Blvd. The Center will be filled with great book, DVD, video and CD bargains. Current members of Friends get early-bird access to the sale at 9:30 a.m. You can become a Friend of the Sherwood Public Library by signing up at the door. From 2:00 to 4:00 p.m., all of the books you can fit in a paper bag are only $1.00! Bags will be supplied at the door. All proceeds benefit the Sherwood Public Library. Sherwood Public Library takes book donations up to the day of the sale. It's located at 22560 SW Pine St. in Old Town Sherwood. But bring your donations by during the Library's open hours only! And, please, only clean and sellable items—no magazines, Reader's Digest Condensed Books, textbooks, or National Geographic magazines. For more information, call the Sherwood Public Library at (503) 625-6688. Regular hours resume when Garden Home Community Library opens at 9:00 am, Monday, March 31st. Contact us if you have any questions. Starting Saturday, March 1, 2008, the Forest Grove City Library will again be open on Saturdays from 10 am-5 pm. Now is your chance: Your original photo could appear on the wccls.org main page later this spring. Starting Monday, February 11, you can submit your original, unaltered, color digital images not previously published and created solely by you within Washington County, Oregon. Location matters! Emphasis will be on landscapes that convey the look and feel of the county. Images of people, pets, domestic or captive animals will not be accepted. The contest will include photos submitted between February 11 and April 30, 2008. See the Photo Contest pages for the official rules and to submit your photo. The WCCLS Winter 2008 Newsletter that showed up at your door recently has an error in it we need to fix. On page 8, under "Time for Teens," the dates for the Teen Art Show at Beaverton City Library are listed as Feb. 12-29. That should be Feb. 21-29. The submission deadline has been moved from the listed date of the 14th. Submissions will be accepted on the 19th and 20th. Beginning at 8:30am on Wednesday, February 13, phone service at WCCLS will be suspended for the day while new telecommunications equipment is installed. If you or someone you know uses the Telephone Renewal number, (503) 846-3245, to get account information or renew items, keep in mind that on Wednesday, February 13, that number will not be available. You'll still be able to reach WCCLS member libraries by phone, however, and you'll still be able to access your patron account online. The Telephone Renewal number should be available again on Thursday, February 14. Thanks for your patience. What kind of photographs are eligible? We're looking for original, unaltered, color digital images not previously published and created solely by you within Washington County, Oregon. Location matters! Emphasis will be on landscapes that convey the look and feel of the county. Images of people, pets, domestic or captive animals will not be accepted. You can get an idea from the photographs by Benny Martin and by others we use now. Visit our main page and refresh it a few a times to cycle through the photos we use there currently. The contest will include photos submitted between February 11 and April 30, 2008. Prizes will be awarded in each age category for First Place and Honorable Mention. Photos will be showcased on the wccls.org for up to one year. Eligibility is limited to amateur photographers. Officers, employees and representatives of WCCLS, the 14 WCCLS libraries and their immediate families, employees of any sponsor and their immediate families are ineligible to participate. WCCLS shall have the right to verify, in its sole judgment, entrant and winner eligibility. The contest is void where prohibited (whatever that means). There will be separate entry and prize categories for ages 10-18 and ages 19+. For official contest rules and photo submission form, watch this space. There will be a contest page, promise! The first meeting of the grades 3-5 father-son book group. Starting in February, the father-son book group begins meeting on the fourth Saturday of the month in the Main Library's meeting room from 10:30-11:30 a.m. The first book shared will be Frindle by Andrew Clements. Future titles will be announced after the first meeting. Free program; no registration required. Call the library at 503-615-6500 with questions. Ideal for investors, brokers, analysts, and researchers, Standard and Poor's Net Advantage provides data on corporate bonds, company profiles, mutual fund profiles, and facts, figures, analysis and projections for publicly held U.S. corporations. Includes S&P's independent research, data and commentary. Standard and Poor's Net Advantage is available in any WCCLS library and from your web browser at home with your WCCLS library card number. Net Advantage appears on the Periodicals page under the Business and Reference categories. Contact us if you have any questions.